Tag Archive | "Dale Larson"
The ceremonial ribbon cutting at the new Cedar Springs Community Library. 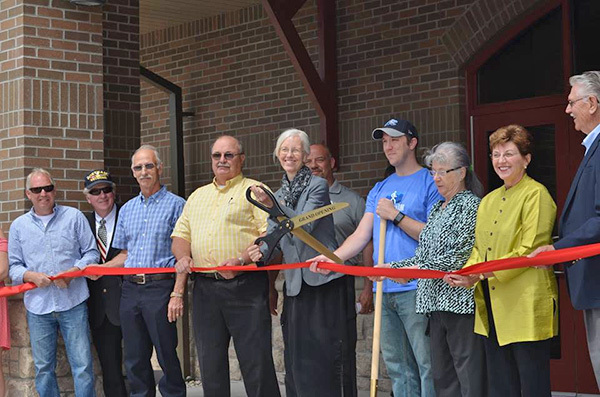 From L to R: Duane McIntyre, licensed builder; Solon Township Supervisor Bob Ellick; Cedar Springs Mayor Gerald Hall; Library Director Donna Clark; CS City Manager Michael Womack; Lakeland Library Coop Director Sandra Wilson; Claudia and Tom Mabie, representatives of the Community Building Development Team. Not shown are Mayor Pro Tem Pam Conley (to the far left of Duane McIntyre) and Kurt Mabie, Chair of the CBDT (to the right of Tom Mabie). Photo by Kathy Anderson. 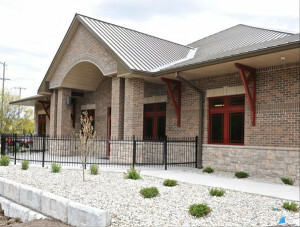 A project planned for many years became a reality last Saturday, May 13, with the grand opening celebration of the new Cedar Springs Community Library, located in the “Heart of Cedar Springs” at the corner of Main and W. Maple St.
Sue Harrison, Master of Ceremonies, introduced the event by thanking the dozens of organizations and countless individuals who have been working on the Town Square, which includes the new library, a Veteran’s Clock Tower, a bridge across Cedar Creek, a steel dragonfly sculpture, and the historic flowing well. 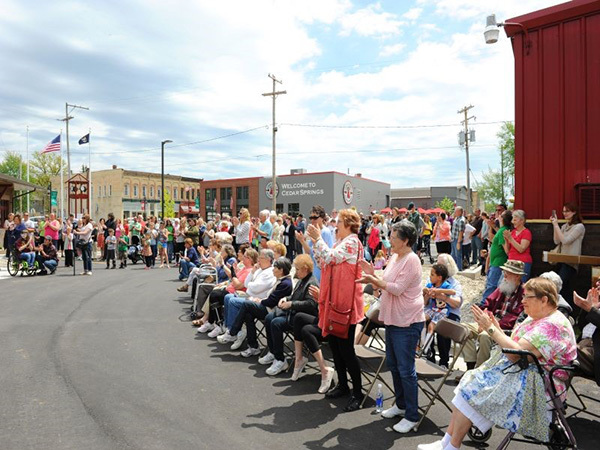 “So much has been done already, but in order to complete the vision, much more funding is needed through donations and pledges through the Community Building Development Team,” she added. 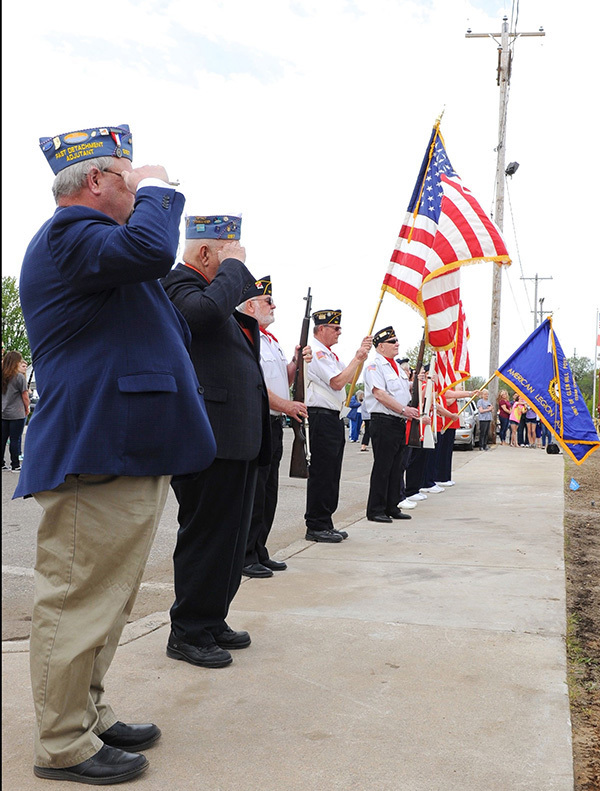 The Ceremony started with the American Legion Color Guard Glen Hill Post 287 raising the American flag and the State of Michigan Flag on the new flagpoles in front of the Library. 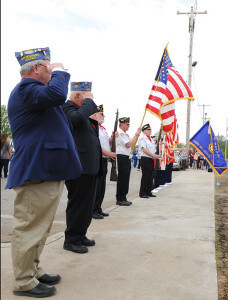 Viet Nam veteran Dan Davis delivered the invocation, which was followed by the playing of the Star Spangled Banner and America the Beautiful by members of the Cedar Springs High School, under the direction of Ryan Miller and Adam Borst. City Manager Michael Womack and Mayor Pro-tem Pam Conley spoke about the city planting a maple tree on the library grounds. Mayor Gerald Hall presented some special “Making a Difference” awards to Duane McIntyre, Kurt Mabie, Dale Larson, and Dean Wall for for their work on the “Heart of Cedar Springs” projects. Louise King, member of the Library Board, gave some of the history of the library in Cedar Springs and introduced Cedar Springs Library Director Donna Clark, who spoke about the importance of the new library to the Cedar Springs Community. 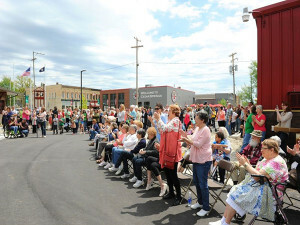 Crowd gathers in front of library for the Grand Opening. 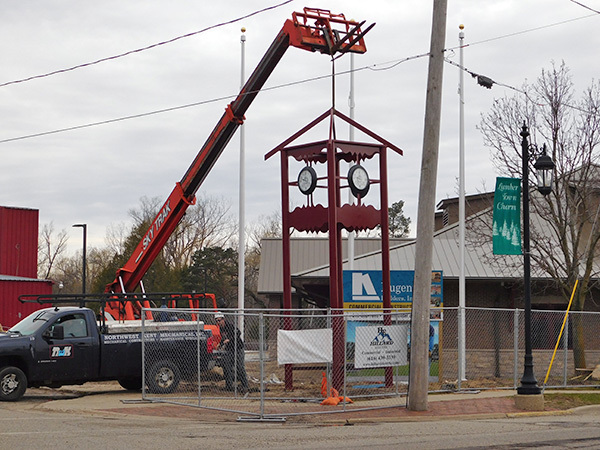 “This is a very significant contribution to our community and one only being accomplished through a cooperative and caring group of people. 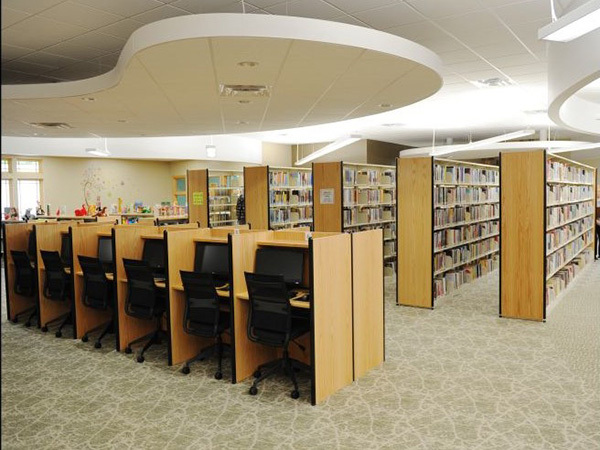 Our community now has its own library where people of all ages can learn, share, gather, and celebrate for many years to come,” said Clark. 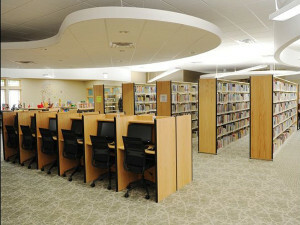 The Ribbon Cutting for the Library followed with many dignitaries present. They were Duane McIntyre, licensed builder; Solon Township Supervisor Bob Ellick; Cedar Springs Mayor Gerald Hall; Library Director Donna Clark; CS City Manager Michael Womack; Lakeland Library Coop Director Sandra Wilson; Claudia and Tom Mabie and Kurt Mabie, representatives of the Community Building Development Team. Mayor Gerald Hall does a ceremonial first check-out of The Cedar Springs Story. He is shown here with co-author Sue Harrison and Library Director Donna Clark. Photo by Kathy Anderson. 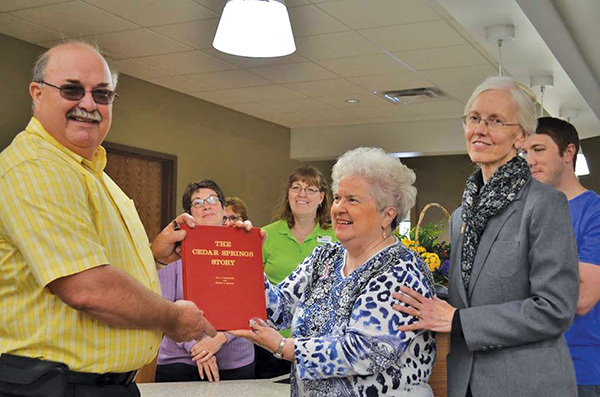 After the ribbon cutting, Mayor Gerald Hall ceremonially checked out the first book, a signed copy of The Cedar Springs Story presented to him by co-author, Sue Harrison. The book will remain permanently in the library and will be checked out in perpetuity to the Mayor. Members of the Cedar Springs Women’s Club served refreshments to the hundreds of visitors who toured the new library and grounds. Visitors also talked with local authors Sue Harrison, Shirley Neff, Kathryn Moore, David Stricklen and puppeteer Rebecca Casavant. The Open House lasted from 2:30-5:00 p.m.
View of the Community Room patio. I have held back my thoughts for a couple of years, but recent events do not allow me to do so any longer. Just when several of us, and what I truly believe to be a majority of the tax payers, were excited that we had a leader with innovative business ideas, as well as a goal of making the city friendlier, a majority of the council voted him out of office in what I would call a very unprofessional manner. I know Mr. Truesdale had some very big, aggressive, modern, and forward-thinking ideas that quite possibly the council was not ready for yet, but in my opinion, it is past time for big ideas for this city. He may have made some mistakes, but who doesn’t? I, personally, like big goals. I look at it if from the point of view that if you only make it half-way to your goal, you still got somewhere! But why should I be surprised when this is the same group that says you cannot run the city like a business? I find this statement ridiculous and cannot believe such a thing is said. Rather, if it’s a school, city, county or any organization, it must be run like a business and get the most out of every dollar you possibly can. Please remember in your thinking, you do serve the taxpayers. The task of the council should be about what is best for the citizen not about which side one is on or about wins or losses. It also does not hurt to be friendly instead of arrogant. Some of the city employees are great, but it seems as you get up the ladder it ends. City Hall should be a friendly place to go, not confrontational. After all, you are working for the citizens of the community! I know some of the council members will say I have no vote or voice, as I do not live in the city, and yes, I cannot vote but I do feel the $468,000 I have paid in property taxes to the city in the last ten years does give me a say! I pay what I consider a lot of property tax without any city services: no water, sewer, leaf pick-up or road maintenance, as our property is on a county road but in the city limits. I have never met the new city manager who has been here over a year. If I was a council member, I would want him out meeting with the tax payers, seeing if they had any needs, complaints, and maybe even new ideas. The last couple city managers at least stopped at our place of business when they first came to town. Our company does a lot of municipal work for several cities throughout West Michigan and I can assure you, our city is very backwards and unfriendly. I truly feel we are a joke to all of West Michigan, not just Kent County. In the construction industry, we are known to be a very unfriendly city to try and build anything for and/or with. I remember when my uncle (Mike Holton) and I donated the heating and air-conditioning to the Kent Theater, I checked to see if we could get the city fees waived. “Oh absolutely not,” as that would set a dangerous precedent. 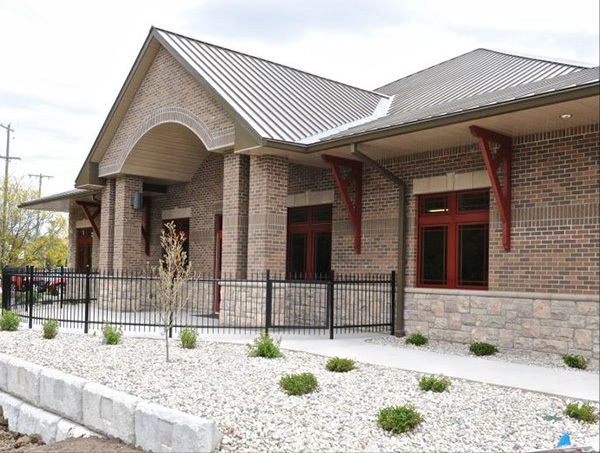 A few months later, we donated the plumbing for a shower building at the Kent County fairgrounds in Lowell. The city waived the fees and asked us if there was anything else they could do; they even thanked us and they weren’t even the owners of the building! I have watched this city squander away so many things in the past, one being when the new Meijer store was being built. Meijer offered to pay the entire cost to run a water main big enough for their store as well as for future use under the expressway. 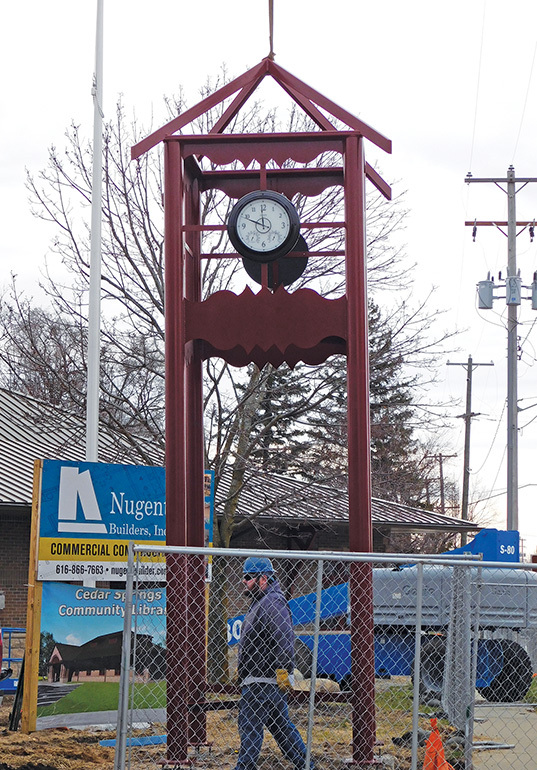 This included all engineering, fees, permits, fire hydrants and related items at a cost close to one million dollars, and all at no cost to the city. As the individual from the West Michigan Metro Council tried to explain to both the city and the township, he encouraged them to take this gift as this is something the two of them wouldn’t be able to afford to do together in the next 10 to 15 years. It was still turned down. In talking to Meilogo. This is my opinion, but I feel this is such an embarrassment to all of the residents in northern Kent County. What a joke that never should have happened. The attorney fees and time that was wasted on this is totally ridiculous! I am old-school and just a plain plumber, but I feel both sides should be tarred and feathered for their actions. Some sensible people from both sides need to get involved and get this issued solved. We do not need a new logo. I truly believe the Red Flannel logo needs to be returned to the people who really own it—the citizens of Cedar Springs and surrounding area. It has been our logo for as long as I can remember. It’s past time to return the community back to the people that pay the taxes instead of a few people, who in my opinion, are trying to feed their huge egos and it appears have no common or business sense. In all honesty, I feel badly that I have to write a letter of this nature. I grew up in this town, graduated from the school system, I’ve ran my business here, Northwest Kent Mechanical Co., for 25 years, and my mother lives here. My dad was fire chief for several years, he was on the council for 15 years, and served as its’ mayor for 7 years. This is a city which I truly cared for in my past, care for in my present, but more importantly for the future. I truly hope this council can go forward in a more professional manner, but I am not convinced it can. Thank you for taking the time to allow me to share my concerns and frustrations.